Motorists who drive a sports car or regularly haul a lot of stuff know that they can’t just add some bass to their rides. The same goes for those who transport their family members on a daily basis. If you’ve always wanted to hear low notes in your ride but wary about the space a subwoofer would take, consider getting this shallow mount sub from JL Audio. It is budget-friendly with average bass output that should satisfy most listeners. This 10 inch subwoofer has an ultra-shallow mounting depth of 3.25 inches. It requires minimal air space so you can use a small enclosure for it. Despite its size, you would be surprised at the sound that this sub makes. Many reviewers on Amazon are happy with the performance of this sub. so you can be assured that the subwoofer will continue to perform well even after long hours of listening. Surrounding the cone is a large, durable rubber that allows the cone to move large amounts of air. Housing the subwoofer is a cast alloy frame that stands just 3.25 inches tall. It may be compact but it gives a very stable housing for the high performance This further increases the lifespan of the subwoofer. 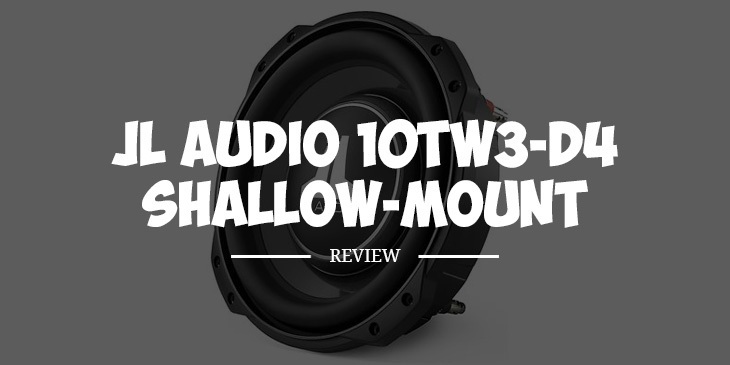 With an RMS of 100 to 400 watts, this subwoofer has a wide watt range for RMS power handling. This means that this sub is capable of projecting clear, clean, and accurate bass lines. This sub is equipped with the brand’s Concentric Tube suspension technology. Its molded structure has a large voice coil with the magnet situated inside it. This eliminates the need for a top plate, further compressing depth and enabling the sub to deliver superior sound despite its size. this sub was designed with JL Audio’s thin line woofer technology. Simply put, it can provide excellent bass performance despite being in tight spaces. Central to this thin design is the Concentric Tube suspension which we had mentioned earlier. Q. What’s the recommended closure for this subwoofer? A. It is designed for sealed closure. A. JL gives owners a one-year warranty on this subwoofer. JL’s shallow mount subwoofer won’t get any awards if we are to talk about sound quality. This won’t blow you away either. But it delivers a very satisfactory level of bass that can improve the sound quality if your car audio. It has the decent bass output that should make you feel every note. Aside from that, this subwoofer gets rave reviews for its ultra thin design. This is a sub that I can recommend to owners of compact cars and mini SUVs. It is affordable, easy to install, and hits hard enough for most motorists.